When I was a child I loved to pick dandelions. I’d pick the bright yellow flowers for my mother and present them to her as a sign of my undying affection. When they matured I pick the bulbous seed-bearing flower and make a wish as I blew the seeds into the wind to scatter across the yards. When you are child you don’t realize that dandelions are weeds, you think they are beloved flowers and natural birthday candles. Now that I’m older I don’t pick the flowers anymore nor do I scatter the seeds by making wishes, but I do still appreciate the tenacious spirit of the dandelion. I think there are some real lessons about our faith that we can learn from this omnipresent pest. The dandelion is fully present wherever it is; it exerts consistent pressure over time to break through any obstacle, and it perseveres, it keeps coming back. they are, spread out across the area, and hunker down. You can spray them, pull them, and dig them out but in a few days, maybe a week, they return. What if we brought that same commitment to be fully present to where God has called us? Instead of looking to the next yard, the next place of ministry, we decided to sink in roots and make a stand to just stay where we have been placed by God. If we believe that God has ordered our lives then our work is part of our worship. Wherever God has placed you at this moment in life is a divine appointment and you are called to be fully present right where you are. I know so many people who spend most of their energy plotting and planning for their next place that they don’t live where they are living. They keep their connections loose, their relationships shallow, and their roots near the surface for quick replanting. The problem with this is that it means their connections are loose, their relationships are shallow and they are not really ever fully present. Dandelion determination means we are committed to being fully present where God has placed us. Pressure—be unwilling to let up. Dandelions exert incredible pressure over time. They can find a small fissure, a tiny crack in the concrete and push through. Over time, days, weeks, months, they push through and bloom where they are planted, but they never quit exerting pressure. They can be treated with Round Up, pulled, weed-eated, and cursed, but they keep coming back, exerting that pressure. Over time that relentless pressure widens the gap in the concrete and then you know what happens? They multiply. One becomes three, three becomes six, and before long you have a line of pressure exerting dandelions in the middle of your driveway. What if we decided that we were going to be unwilling to let up in the places where God has called us to make a difference? What if we were going to exert constant pressure for good, for justice, for hope right where we find even the smallest crack of opportunity in our community? I know pushing against the concrete of negative attitudes, dated traditions, and deep prejudices is exhausting. I know it seems like you are making no progress, but keep pushing, keep exerting the pressure because eventually you will get enough light, enough soil, enough hope to bloom. Don't get discouraged when they bring out the Round-Up or the weed eater, just dig those roots in deeper and stand your ground, right there in the middle of the driveway peeking through the crack of hope, justice, and good that you have found. 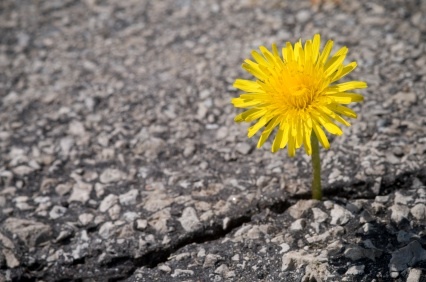 Dandelion determination means you are unwilling to let up, that you keep pushing even when it seems the concrete isn’t moving. The dandelion always wins in the end. Perseverance—be unwavering in your commitment, don’t quit. Dandelions don’t quit. Have you notices that no matter how many you pull, no matter how much “Weed & Feed” you spread that come next Spring they dandelions are back? Just like they are fully present and exert consistent pressure, they persevere, they don’t quit. Quitting has become an epidemic in our culture. When did “cut and run” become a spiritual gift? When did quitting becoming an attribute of Christians? I can’t find it in the scripture anywhere. Quite the opposite, from Abraham to Paul the biblical authors remind God’s people to stand, stay, and stick no matter what. No matter if there is persecution, discomfort, or those who are disobedient in the community, God’s people are called to “run with perseverance the race marked out for us.” Don’t get distracted by the difficulty you face and the struggles you are enduring, persevere. Don’t let those who are negative, nagging, and nasty get you off the path, persevere. I know its tough to stand, stay, and stick, I get that! Faithfulness sometimes seems futile but God insures us that eventually it will be fruitful. Dandelion determination means that when the rats are leaving the ship, the captain stays and keeps working to bring it into the harbor. Dandelions don’t quit.